the town's glorious past. Today, petrol is sold in bottles of 1,5L in sundry shops. 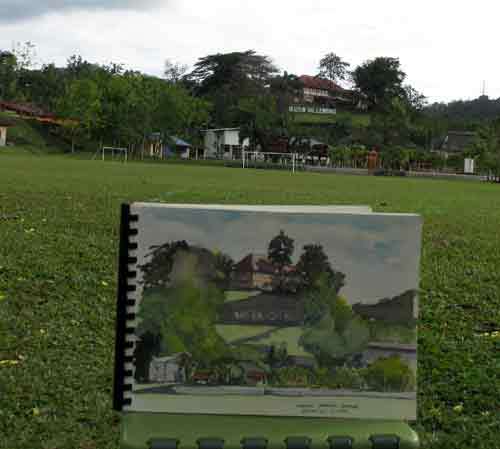 Did you know that Sungai Lembing did not have its town petrol station? It used to, more than 15 years ago, I was told. Not anymore. If you are visiting it, you had better make sure you have enough petrol or fill up your tank at the nearest petrol station 28km away, just after the East Coast Highway exit. Otherwise, you may have to flag down a passing motorcyclist and get him to buy you petrol should you run out of fuel. According to a local there used to be a petrol station operator here until his business was killed by the lack of demand and the annual floods that inundate the former tin mining town. This is my painting of the petrol pump which pumped its last more than 15 years ago. I painted the relic seated along the corridor of one of the old shop houses lining the main street. Townsfolk who mostly rode motorcycles buy their petrol from sundry shops at RM4 per 1.5-litre bottle. its rightful place by the Sungai Lembing market (at right). 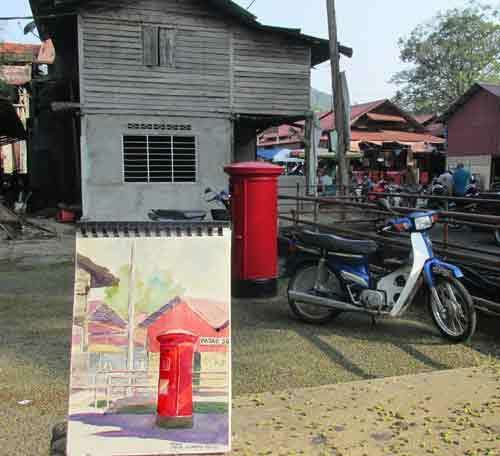 Another relic of Sungai Lembing is the Victorian pillar post box, which townsfolk said is still in use. This post box is just a stone’s throw away from the wet market. According to locals, it was put in place ago during the town’s glory days when the tin industry flourished. However, the locals continue to care for this relic till this day. According to a local who approached me while I was painting, someone had tried to remove the pillar box some years ago because of its heritage value. Fortunately, the townsfolk intervened and prevented the relic from ending up in an antique lover's collection. My sketch of an old restaurant complex, now left to the elements. This is one of my favourite fishing enclaves on the southern coast of the peninsula. 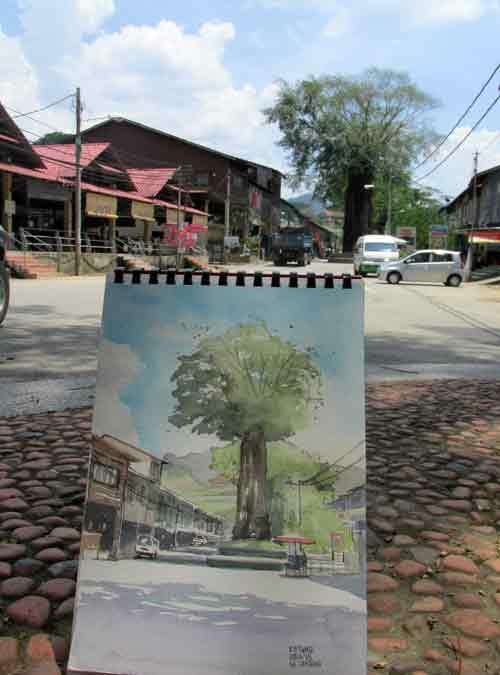 It lies about 13km from Muar town. 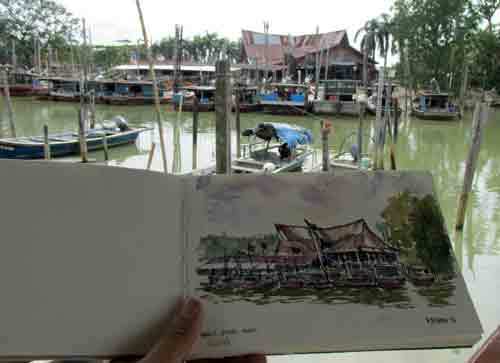 Parit Jawa is increasingly known as a seafood haven, especially Asam Pedas which locals claim is better than Malacca’s. I loved this coastal fishing village for its serenity. At high tide during certain times of the year, the water level at the jetty reaches almost the road level. Life here is all about fishing and the hive of activity for locals is the morning wet market at the entrance to Parit Jawa village. Just before you enter Parit Jawa village, you will come across a canal, which gives the town its name, I am told. If you are into asam pedas and try the outlets at the hawker centre for a no-frills locally-popular asam pedas. Prices are reasonable depending on the fish you pick such as kembong (horse mackeral), siakap (seabass), red snapper (ang choe) and mayong (a species of sea catfish). Of course, if you want to indulge in variety, the many restaurants near the jetty there will be able to handle your voracious appetite. Be prepared to wait and pay slightly more though. 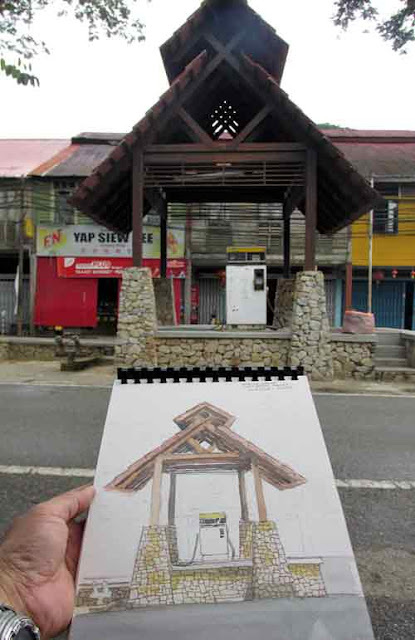 I sketched this picture of an old run-down building on the other bank of the estuary. I was told that it was formerly a restaurant complex but has since been abandoned. There are many fishermen’s huts and a concrete jetty built out to sea. From the jetty, you can catch sight of Lesser Adjutant storks foraging for meal along the mudflat flanking the estuary at low tide. 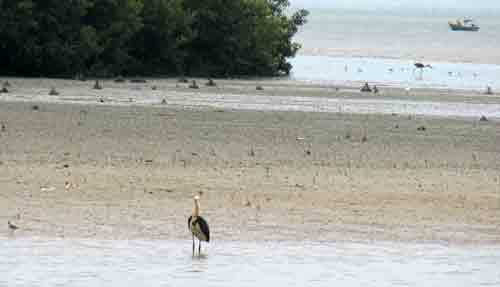 A Lesser Adjutant stork foraging for food at low tide. LAST Sunday evening, while waiting for my wife to finish her grocery shopping at Pasaraya Ong Tai Kim in Gombak, I decided to quench my thirst with a cold can of soft drink along the corridors. As I was sipping my drink and staring at the surrounding area which looked more like a foreign land populated mostly by people from the African continent, an old Ah Pek standing not far away caught my attention. The old man, who appeared to be in his 70s, was wearing a yellowed Eagle-Pagoda T-shirt, knee-length trousers, and a pair of dirty rubber slippers. He was holding onto a crumpled Sogo plastic bag as it contained his prized possessions. And he was keeping an eye on me. At first, I thought he was a beggar. Just a day earlier at a hawker centre nearby, one had approached my wife and I while we were having lunch. My wife had given him a ringgit. I had seen the beggar before in several places in the Klang Valley over the years. He was a lanky elderly man, about 70 years old, with no apparent disablement but who was hobbling around with a sawn-off broomstick in one hand and a plastic cup in the other. The few times I spotted the beggar, he was going from table to table, wearing a forlorn look. He doesn’t speak much but would instead shake the plastic cup containing loose change to attract the attention of his target, and when he succeeded, he would bow several times in a woeful manner. If they ignored him, he would waste little time but quickly moved to the next table. After my wife had given the beggar money, I had told my wife to be frugal with her generosity, especially towards beggars. Her generosity could encourage the beggar to continue with his ways, or worse, motivate other people with similar intentions to do the same. For the little we knew, I said, the man could have belonged to a syndicate of beggars we read about now and then. The old man with the plastic bag at Pasaraya Ong Tai Kim looked as old as the beggar we met. For a moment I thought he would approach me for money and when he walked towards me, I almost applauded myself for being able to read his move. However, when he asked politely if he could have the aluminium can once I had completed my drink, I silently apologised for jumping to conclusions. “Sure, why not?” I said as I handed the man the empty yellow can. He thanked me as he took the can, promptly dropped onto the ground and crushed it with his right foot, before putting it into his plastic bag which contained other crushed cans. “Good price in aluminium scrap?” I asked. The old man looked at me, smiled, and replied with a nod. “Better than newspaper and used cardboard,” he replied in local Hokkien. In the past, he said, he only needed to scour the alleys in the mornings to collect discarded paper cartons left behind the shops. These days, the foreigners working at the shops kept them for themselves and sold them to the scrapyard, he said. “But people still throw away aluminium cans,” the old man continued. “At least I can still get 50 or 60 pieces a day if I go out early in the morning and later in the evening. I asked him if he had a home, a family, or any children. The old man nodded and said that he lived with his daughter-in-law and a grandson who would be going to school soon. His son, he said with some reluctance, had left the family two years ago to go to Cambodia in search of greener pastures. When I said he could apply for government assistance, my good intent was met with a cynical smile. “Do you really think the government has enough money to give away some more?” the old man asked, shook his head, and left without another word. As I made my way home, I told my wife about the elderly can collector. In the past, whenever I saw old people rummaging through rubbish piles, I used to wonder if it was a reflection of the deteriorating filial piety in our society or was it that life was getting so hard that the elderly have to stay alive by scavenging for discards. Perhaps it was just an eccentricity that came with old age that could be dismissed with a sigh as being part of life. Comparing the old man with the beggar we ran into earlier, I realised that the former chose to live with dignity. To me he is leading a more purposeful life than some people his age, especially those who had been blessed with good fortune and station in life but continue to waste the remaining daylight of their twilight years on petty matters and creating unhappiness around them.